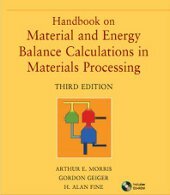 Handbook on Material and Energy Balance Calculations in Materials Processing, 616 pages, Wiley/TMS, 2011. ISBN 978-1-118-06565-5. Available from Wiley, Amazon, or TMS. Please download the Handbook Table of Contents.